A groomer does her best work when she is calm and comfortable. A rushed, distracted groomer is more likely to make mistakes, resulting in accidents that injure us or the pet we're working with. An unhappy, stressed-out groomer projects her emotions, creating an uneasy environment for the pets in her care. Groomers know this, but no matter how thoughtful and strong-willed she is, no groomer can simply will her stress away. She can't force herself to find inner peace. 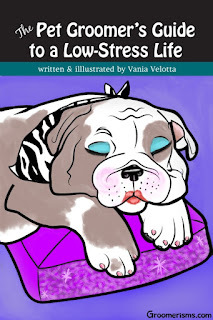 She has to eliminate stressors as much as possible and take time to self-soothe. That can be difficult to do in a service-based industry. Groomers tend to be people-pleasers by nature. We care deeply for animals and want only the best for them. We also want our human clients to be happy, even if it's at our expense. So we need your support and cooperation to take the very best care of your pets. Everyone benefits when grooming shops and the groomers who work in them are calm and happy. 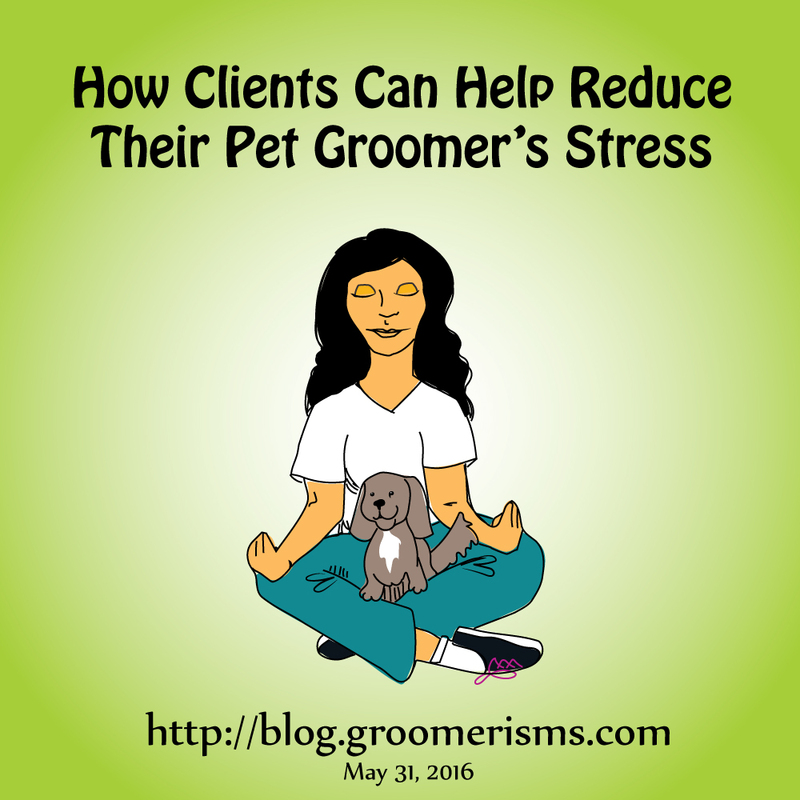 So read on to learn what you can do (and stop doing) to help lower your groomer's overall stress. Empathy is both a gift and a burden. Feeling the emotions of others without the need for words is one of the things that helps groomers work well with animals. A cat can't say, "You're combing too hard," but an empathetic groomer can read his body language and understand his message. The problem is that, when you're so open to feeling everyone else's emotions, it can be exhausting and overwhelming. When animals are uncomfortable, for any reason, we feel their pain. When people are angry or upset, we feel their anger and upset. When pets die, we grieve with their parents. When clients are unhappy with a haircut, it bothers us. When we accidentally injure a pet, it traumatizes us, far more than any injury to our own body might. Some groomers build emotional walls and come across as cold or gruff. It's difficult to be open and warm all the time when it means letting in an onslaught of emotions. Take excellent care of your pet. Neglected animals break our hearts. Untreated veterinary issues both infuriate and devastate us. We do our best to treat your pets like they're our own, so treat them well. Matted pets often suffer from poor circulation, chronic pain from pulling, and skin infection from trapped moisture. If your pet develops matting, understand that the humane thing to do is take it short and start over. Then, get on a regular schedule. Shorter-haired dogs with undercoat can mat as well and trapped fuzz interferes with their coat's natural ability to regulate their body temperature. Overgrown nails can interrupt your pets natural stride, putting strain on their back and shoulders. Nails left long over time can warp the shape of the feet, leading to arthritis and other painful conditions. Many pets are prone to ear infections that can be prevented with diligent ear cleaning. Teeth require almost daily brushing to keep tartar at bay. Oral infections are just as painful for pets as they are for people, so follow your vet's recommendations for teeth cleaning. In addition to proper grooming, lifestyle factors like nutrition, exercise, and mental enrichment are important for your pet's well-being. Anxious pets in pain are challenging to groom. Seek knowledge and apply it toward having as healthy, well-adjusted a pet as possible. Groomers hate to say no, so when the phone is ringing off the hook, many of us will keep on taking appointments until we're grooming at a dead run 12 hours a day for days (or weeks) on end. That's fine in the short-term (like during the holiday rush), but grooming is hard work and all those extra hours can take a heavy toll on how your groomer feels, both physically and mentally. If your groomer is overbooked, don't guilt trip her or beg her to "fit you in." Tell her you're happy the business is doing well and take her next available appointment. To ensure your pet gets groomed when he needs it, start scheduling your appointments well in advance, especially around peak times like holidays. Remember, the harder your pet is to work with and the more hours he requires to spruce up, the more considerate you should be of your groomer's time. Not only do groomers work too much, they tend not to play enough. Taking time off and away from the shop can be impossible for groomers who feel obligated to be available to their clients year-round. But a week or two of quality time spent on a beach is often exactly what a groomer needs to refresh and recharge herself. The most thoughtful clients ask groomers about their vacation plans and adjust their own schedules accordingly. You may have to shift your regular five week appointment because it falls in the middle of your groomer's meditation retreat. And since it's easier on us to groom your pet earlier than usual rather than later, we appreciate it when you decide to schedule the week before our vacation and wish us a relaxing time. Every pet can benefit from regular grooming. For continually growing coats and undercoated dogs, it's an absolute requirement. Unfortunately, pets don't always like to cooperate with what's best for them. This can be frustrating for your groomer and greatly increases your pet's likelihood of stress and injury. If your pet is large, strong, and/or aggressive, they can cause very serious problems for themselves and your groomer. Our backs can only take so much abuse and a bad bite in the wrong place could end our careers for good. Be open and honest with your groomer about your pet's behavior. Do not keep your dog's bite history a secret. If your groomer tells you that your pet is argumentative, don't take it personally. It doesn't mean they dislike you or your pet. It just means they need your help making grooming run more smoothly in the future. Listen to their training recommendations and follow them. You may be asked to simulate grooming at home to get your pet more comfortable with things like electric clippers, brushing, and standing still on a table. Often, groomers will ask you to bring your pet in more frequently so that each session can focus less on hair trimming and more on training and building a rapport. Tiring your pet out with a long walk or playtime before grooming can help greatly with aggression, nerves, or excessive exuberance. You may be asked to withhold food or water in the morning before grooming for pets who have accidents. And no, it will not make things easier if you stay and try to help. Most pets are better-behaved when their owner isn't around to distract them. There's nothing better than hearing, "This is the best my pet's ever looked!" On the flip side, groomers get frustrated when they can't make a client happy. Sometimes it's not possible to give you what you want (sorry, but matted pets DO need to be shaved short) but if Fluffy is tangle-free and well-behaved, don't let miscommunication create a style disaster. Be specific whenever possible, but be a little flexible, too. Groomers are artists and pet styling can be highly subjective. The best relationship you can have with a groomer is a collaborative one, where you work as a team. Not specific enough: "Short but not too short"
Too specific: "Make sure you clean her ears and trim her nails. Shave her with a #5 blade with the direction of the hair. Oh, and bathe her, too!" Just right: "Half off her body, with a light trim on the tail and ears." If you're not sure what you like, ask for recommendations. If you have a specific issue (a messy beard, for example), let us help you solve it. Keep in mind that groomers have varying levels of knowledge and skill. They may excel in some aspects of grooming and struggle with others. Sometimes groomer and client style just doesn't mesh. Give your groomer a few chances to get things the way you like them, but if it's not working, wish her well and find someone who better fits your needs. Managing the flow of pets and people into and out of a grooming salon can be tricky. Each individual human and animal has its own individual needs. Sometimes pets are more work than expected (sometimes a lot more) and throw everyone off-schedule. Medical issues, behavioral issues, early drop-offs, late drop-offs, space constraints, excessive phone calls, power outages -- there are lots of ways an otherwise normal grooming day can be disrupted. So when your groomer says, "I'll call you when your pet is done," please don't show up an hour later expecting your pet to be done. Wait for her to call. A little awareness and common courtesy goes a long way towards making a grooming day less stressful for everyone involved. So obey all posted signs, read through policies and procedures that your groomer shares with you, and remember that there are other clients and other pets who need your groomer's attention, too. If you absolutely need to pick up before a certain time, tell your groomer about it when you make the appointment and again when you drop your pet off. If you can, pick up your pet immediately after you're called. If you can't, let your groomer know when you expect to pick up. If you're given a pre-set pick-up time, come then. Pick up before closing time. Don't make your groomer sit around waiting for you. If you have an absolute emergency, call and expect to pay a late pick-up/boarding fee. Always bring your pets in on-leash or in a carrier. Don't use a flexi-leash (or if you must, keep it short and locked). Don't let your dog jump on random cars in the parking lot. Don't let your dogs play with other dogs in the waiting area. Don't let your dog's leash get tangled around other dogs/people/objects in the waiting room. Don't let your dogs jump on people/pee on the walls/etc. Always walk your dog before grooming and clean up after them. Be on time for your appointments (neither late nor early). Call if you expect to run late. Be prepared to reschedule at your groomer's discretion. Give your groomer at least 24-48 hours notice when you need to cancel or reschedule an appointment. If you have an emergency, call as soon as you can and expect to pay a late cancellation fee. Don't make an appointment and neglect to cancel it. No-shows cost groomers time and money. Keep your phone charged, turned on, and on your person in case your groomer needs to contact you. While there are plenty of groomers whose prices adequately reflect their work, there are still many who struggle to earn a comfortable paycheck. Grooming prices vary from region to region, based on supply and demand, but owner/groomers have overhead and business expenses to consider. Too often, people-pleasing groomers cave in under pressure from clients looking for a deal. Many groomers are afraid of the criticism that may come from raising prices, so they avoid it year after year, even as the cost of living and prices for supplies goes up. Everyone has budgets. Everyone is concerned about money. But if your groomer isn't charging enough for your pet's haircut, she isn't going to be as relaxed and happy about doing the work as if she were appropriately compensated. 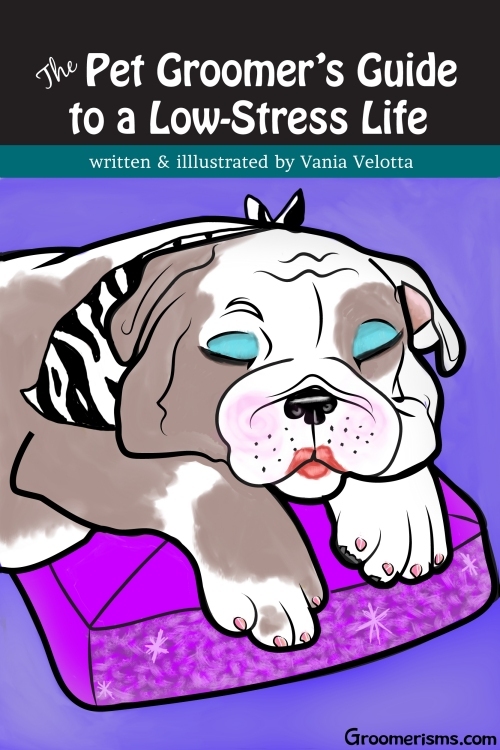 A professional isn't going to take her frustrations out on your pet, of course, but animals are great mood detectors, and they will certainly feel her stress at being undervalued. Never, ever say that your groomer is "too expensive." If her services are out of your price range, feel free to try out a lower-cost groomer. If you're happy with those services, stay there. If you're not, return to your regular groomer with a renewed appreciation. As they say, you get what you pay for. We understand that grooming can be a significant financial investment. If you need to spread out your grooming appointments to save money, that's OK. Adjust your styling expectations accordingly. If you can only afford to groom your poodle every three months, ask for a haircut that will last that for three months (spoiler alert: it'll be short). Some groomers do in-between brush-out services that are less expensive than a full groom. Some may barter for services. Other groomers may offer basic grooming classes that can help you maintain your pet at home. We're happy to help find a solution that'll help you afford your pet's maintenance, but don't expect us to take a pay cut. Remember that well-maintained, well-behaved pets are the key to maximizing profit for your groomer and minimizing cost per appointment for clients. Don't be that client who brings in a matted mess once or twice a year with rotten teeth and a biting problem, shows up late, and then complains about the haircut and the price. Often times, it's the most rule-abiding clients with the most well-behaved pets who offer the best compliments and the most generous tips. If that's you (or you've decided to become one of those clients after reading this post), thank you. We love you dearly. You are the backbone of our business and the bedrock upon which we build our low-stress life. No matter what your groomer's price range, tip her well, always. Tell her that you appreciate her. Praise her around town and refer new clients to her. Support her shop in every way you can. If you don't like her or her work, don't bad-mouth her or her business, just find a groomer you do like. 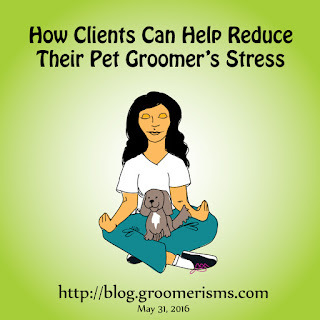 Now that you've made it through the list of do's and don'ts, don't worry too much if you're a "less than perfect" client or you have an unusually challenging pet to groom. If every pet and every client was sweet and easy to handle all the time, we'd probably get bored. We often find our more cantankerous clients the most rewarding to work with. And it makes our day when a stressful client acknowledges our patience and thanks us for taking such good care of them and their pets. When we raise our prices and a client says, "Good for you!" When clients say, "No rush. I'll pick up whenever you're ready."